Heather and I decided to help fill some available spots on a trip with Porpoise Bay Charters for the Family Day long weekend. I had been looking forward to it for weeks! We decided to come up on Thursday night to try something different. 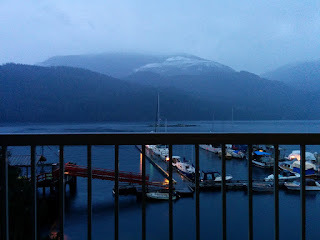 Kal asked us to be ready Friday morning to dive Boom Islet in the Skookumchuck Narrows, so instead of getting up super early we'd stay in Egmont and have a leisurely morning instead. It turned out to be a pretty good idea! 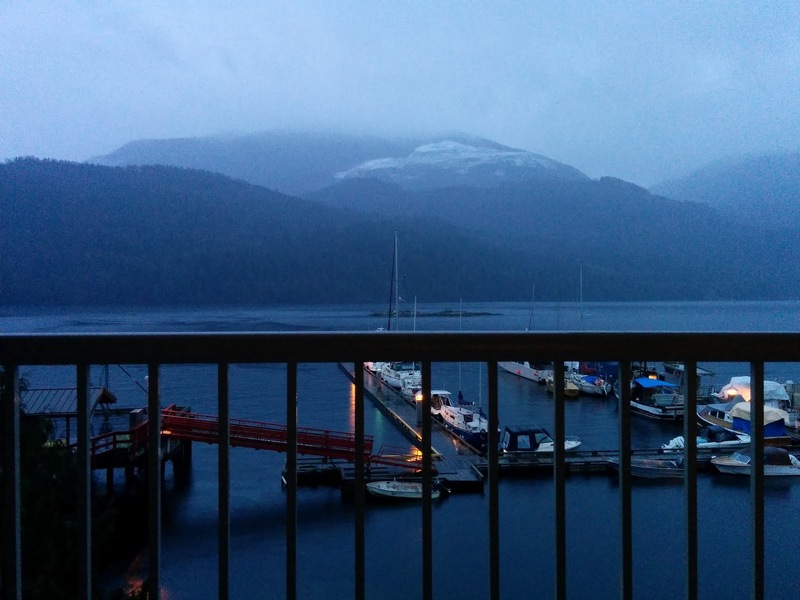 This was the view from our room: rainy but the visibility looked great! We stayed at the Bathgate Hotel and it was nice. For next time, we'd make sure to call ahead first because by the time we arrived at 8:30 the store was closed. We did meet the person with our keys eventually, but without cell service we couldn't even call someone! Heather found a bell on the wall of the hotel later, but we missed it when we arrived. After a relaxing sleep in a warm room, we were ready. Before going further, I will put the trip video here. If you just wanted a good overview of the trip, you won't have to go further. Also, the link to the trip photo archive. We met our dive group consisting of Wayne, Otto, Karen and Bernie. Kal showed up at 10:30, we loaded up and were on our way. The tides waited for no one. Happy people! 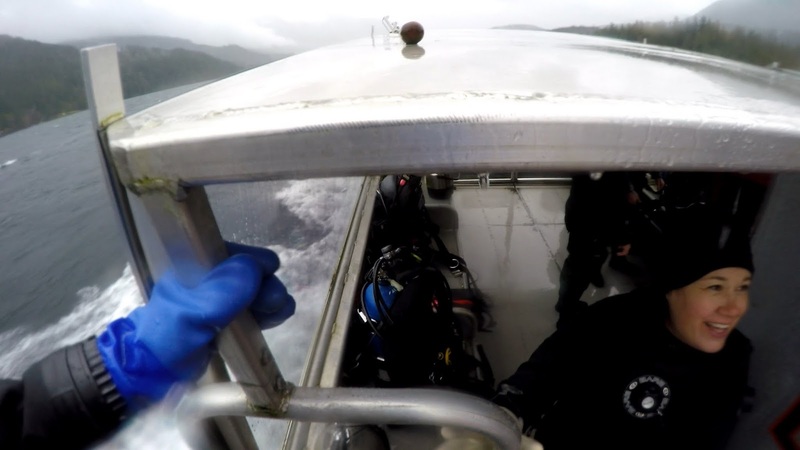 The first dive was at Boom Islet in the Narrows. We got a quick briefing and splashed into the water. It was going to be a good one! I couldn't resist a selfie. We came across one of many very photogenic puget sound king crabs. By the end of the trip, we had seen a lot of them. Boom Islet had huge colonies of the very cool fringed filament-worm. We also found a rock entodesma (also known as the northwest ugly clam, aptly named!). Heather spied a pretty orange spotted nudibranch (also known as the clown nudibranch). The other highlight of Boom Islet were the large fields of painted anemones. At the end of the dive, we were greeted by an eagle probably looking for his dinner. Very cool! After a trip back to home base for lunch, we headed out to South Sutton Island for the last dive of the first day. Very soon into the dive, we came across huge numbers of pearly nudibranchs. We didn't see any lewis moonsnails, but we did see their egg casings. There were quite a few things that were very Doctor Suess-like, like this basket-top spaghetti-worm. There were many opalescent nudibranchs, one of my favorites. And again we found a puget sound king crab. I wasn't sure about this nudibranch, but think it might have been an opalescent nudibranch. We also found lots of stubby squid eggs. The end of day one left us in the dark, literally! The bad weather had been wreaking havoc with power lines, and for most of the afternoon the power was out. The power came back on that evening, but then there were some very impressive lightning strikes nearby and it went out for the rest of the night. Thankfully Kal and Ann were quite well prepared, and it just added another element to the camping atmosphere. The next morning brought coffee on the gas stove, and breakfast by candlelight. Then it was out to Caldwell Island, where one dive team investigated the gorgonian corals. 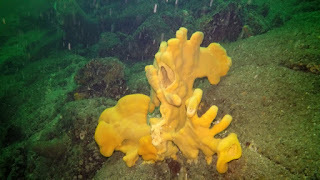 Heather and I had a nice recreational dive and came across many cool things. A very nice golden dirona. One of many rhinocerous crabs throughout the trip. A very pretty swimming anemone. Then we stopped off at a new dive site (to us), Agnew Point. Heather, myself and Bernie did that dive as Wayne, Otto and Karen sat it out after their deep dive at Caldwell. They did see some very nice gorgonian corals there though! Agnew turned out to be an amazing dive. There were an impressive number of crimson anemones. And very impressive boot sponges. After reviewing the pictures later, we noticed this one with a great shot of a candy stripe shrimp, look carefully at the base of the anemone. Throughout the trip, we saw many ling cod egg masses. Kal was happy to hear this, as the ling cod were facing quite high fishing pressure. My comment was that even though there were lots of egg masses, the parent ling cods were all quite small. Much smaller than the ones I was used to in Howe Sound. Another great puget sound king crab. We headed back home for a quick break, and the power was still not back on yet. Thankfully Ann had the barbecue going, and there would be a delicious pork loin for dinner. Before that, we headed over to Swede's Reef for a before-dinner dive. Swede's Reef was one of our favorites. We came across this odd sea cucumber, but further research showed it was just the regular California sea cucumbers we were used to (just a color variant). There were more excellent opalescent nudibranchs. And a very mottled looking gumboot chiton. Swede's Reef didn't give us as many good critters this time, but it was still an enjoyable dive. That evening, dinner was fantastic and the power came back on. Even better! We had a great sleep, and breakfast, and then it was back to diving. Our first dive was at the Power Lines (one of my favorites). It was as good, if not better than previous ones! It was a bit rough again, so it was a quick entry and descent. The cloud sponges were amazing as usual. The stars of the show were the dwarf gorgonian corals. They were everywhere! I don't remember seeing so many ever before. It was most likely that they had always been there but I just never noticed them. We also came across more pink hydrocoral. And a spiny lithod crab out in the open. Normally they were always hidden in cracks. And another giant sea lemon. I found four Oregon tritons laying eggs in a group, very cool. 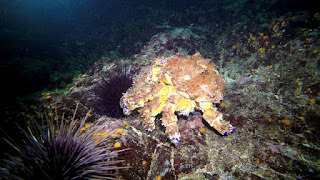 Another rhinoceros crab. They were starting to get old hat! We headed back to home base, and the weather got much better. Before lunch, Kal took Heather and I over to Bathgate Rock, just in front of Egmont. 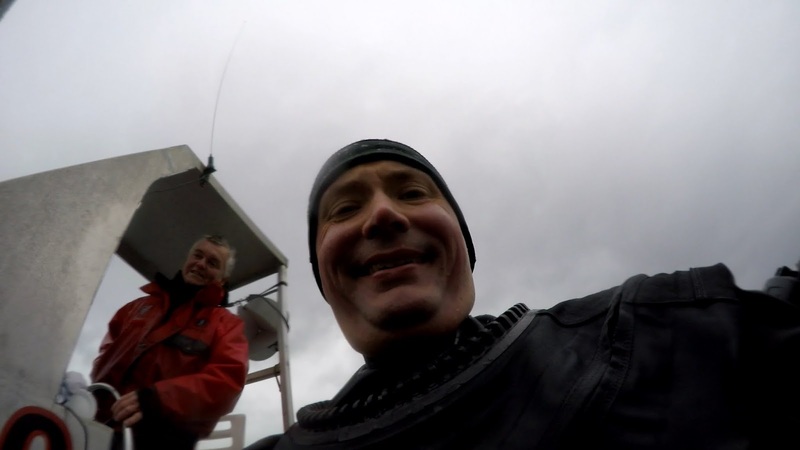 It was a fun dive! He wanted us to have a look for swimming scallops, to see if they had started to make a come-back. We found only two, but at least we found some! I found a nice old green 7-Up bottle, and Heather found an old fishing rod. It sure was a good place for treasure! Our last dive of that day was Captain's Corners. We saw great cloud sponges, more crimson anemone's and lots of kincaid shrimp. Heather also found a northern abalone, which is in the video. That night included another amazing dinner, hot tub, and a great sleep. The next morning brought the last dives of the trip. It had come too soon! We had eggs Benedict to fuel us, and then we were off on a perfect day. Our first dive was at Argonaut Point. The visibility was amazing. This picture was of the boat from fifty feet down. 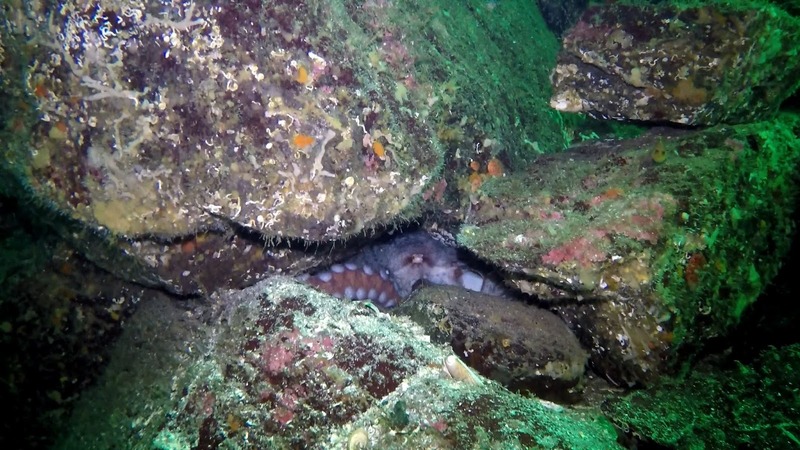 We also came across an octopus on that dive, very nice! It started to get curious, but then changed it's mind. Check out the video. A shy juvenile yelloweye rockfish. During our surface interval, Captain Kal gave us a tour of the area. There was a spot where a huge slab of granite broke loose and slid into the water. We also toured past the spot where Relic's jet boat did a jump over a spit of land in the Beachcomber's series. The last dive of the trip was at Jaggy Crack. It turned out to be another great one. We came across a poor little northern kelp crab missing both his front claws. There were several of the biggest giant nudibranchs I had ever seen. One with a very different coloring. 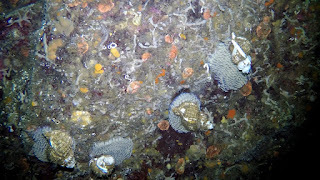 There were even more crimson anemones on this dive, and even more kincaid shrimp. And, even better, Heather got a great picture of a candy stripe shrimp. And that was it! We packed up after an amazing chilli lunch and Kal ferried everyone back to the dock, after saying farewell to Ann, Nanuk and Nemo. One final very interesting encounter awaited us at the government docks. Huge clouds of krill, dense enough to to be pink when looked at from above. This one was larger than two kayaks put together. 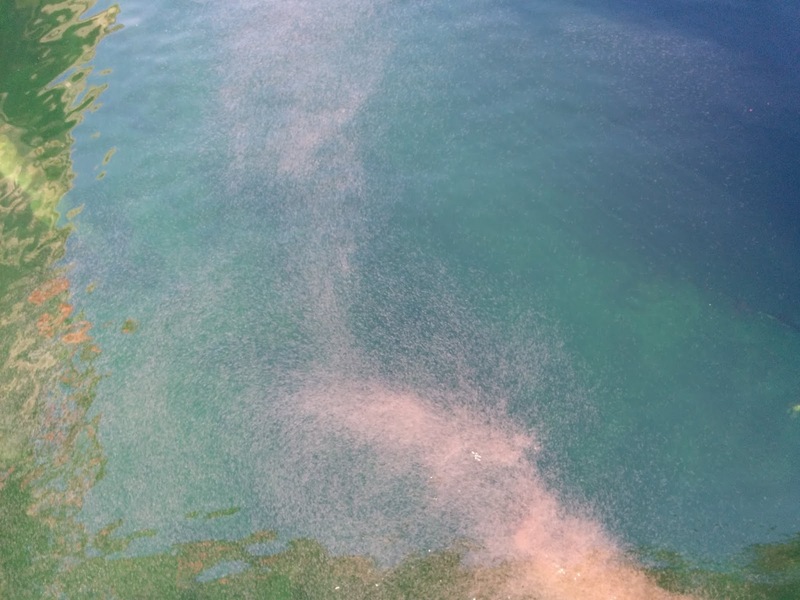 The krill were going nuts at the surface, making the water almost boil. One of the long-time-locals said they had never seen this much before. We got some video above and under the water. Pretty cool! Donna Gibbs and Jeff Marliave identified this as Euphausia pacifica. All in all, an excellent trip... Thanks again Kal and Ann! Grand piece of Information!!!!!! 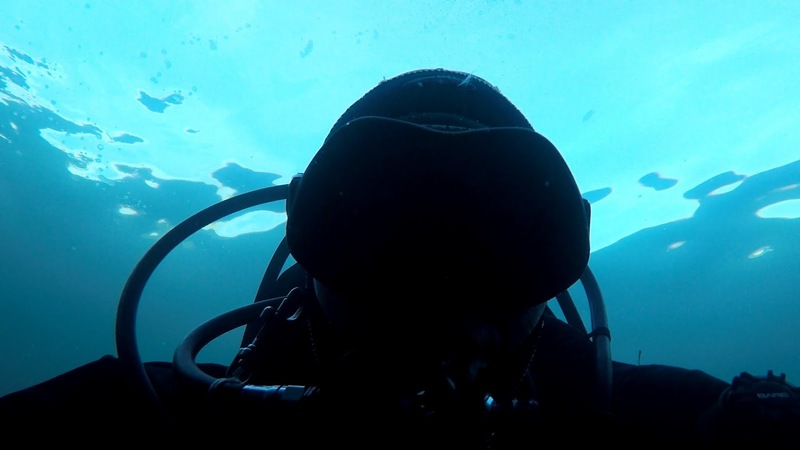 scuba diving isn't dangerous if you follow the correct rules and techniques. If you're eager to strive it then realize an area to dive and speak with the instructors there. Folks that get hurt whereas diving typically forgotten the security rules that almost all individuals follow. After you begin your diving it'll be better to dive in a pool first which is able to facilitate build your confidence before going into the Open Water. You'll be able to conjointly realize a "Discover Scuba" category which will allow you to strive it out while not going for the entire certification.